Lorenzo Comolli took this photo of the Andromeda Galaxy on Nov. 16, 2012 from the Apennine mountain village of Bogli, Italy. He used a TEC 140 telescope and Canon EOS 5D with Baader filter, Gemini G-41 mount to capture the image. The image was released to SPACE.com June 26, 2013. Observing from a small village in the Apennine Mountain range in Italy, astrophotographer Lorenzo Comolli took this spectacular image of the Andromeda galaxy. Comolli snapped the photo Nov. 16, 2012 from the village of Bogli. He used a TEC 140 telescope and Canon EOS 5D with Baader filter, Gemini G-41 mount to capture the image. The image was released to SPACE.com June 26, 2013. 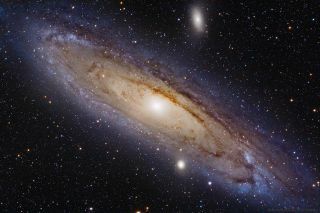 The Andromeda Galaxy is 2.5 million light years from our own Milky Way and is our closest neighbor. The galaxy is visible with the naked eye and contains hundreds of billions of stars that diffuse light. Together, the Andromeda and Milky Way galaxies dominate the Local Group of galaxies.